Most succulents and cacti grow for only a few months out of every year and for the rest of the time they are resting and have very few needs. With some exceptions a potted cactus will try to order its life according to the changing seasons by growing mostly in the spring and fall and resting shortly in the hottest part of summer and a much longer sleep through the winter. It is important to provide plenty of water during periods of growth and even more important to with hold water while these plants are resting. Tap water is hard on cactus plants and will gradually cause them to stop growing, and more and more growers are using white vinegar to modify tap water for healthier cactus plants. There is a great article on this subject in the September through October 2008 issue of the Cactus and Succulent Journal put out by the CSSA, The Cactus and Succulent Society of America. 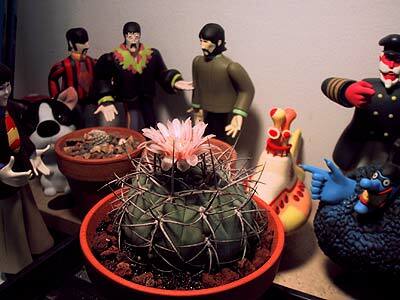 We never use tap water on any cactus plant, but this is surely important enough to write about on this web page. The recommended amount in the Cactus and Succulent Journal of white vinegar to modify tap water is one table spoon for five gallons of water. By my math for smaller amounts use 9 drops of white vinegar in one quart of tap water or .26 cc of white vinegar in one litre of tap water and the water will be safer to use on cacti. If it is unavoidable to use tap water it can be modified with white vinegar, and that will help keep cactus plants healthy. Rain water or distilled water will be better than tap water, but if tap water has to be used it is better to modify it with white vinegar. Water modified with white vinegar needs to be used or disposed of the same day it is mixed because it will spoil if stored. Pouring a stream of water over these plants with a watering can, as if they were a spider plants, should be avoided, because this method produces conditions more favorable for growing fungus then succulents. When the plants are in a growth cycle they will be interested in plenty of water, and bottom watering is the best method. If the plant is not in a rapid growth cycle its better to avoid soaking the roots and a lit occasional misting can be a good way to regulate water. Wetting these plants from the top with very lit mistings will require avoiding two potential problems. The first is that ugly deposits from tap water can accumulate on the skin of succulents and using rain or distilled water can avoid this problem. The second thing that needs to be avoided is wetting the bodies of these plants while they are in sunlight. 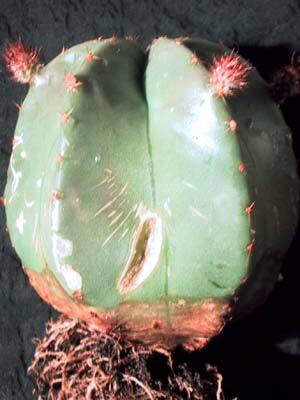 A wet cactus in the sun light can cause sun burning which can lead to scares or even fungal infections and death. Bottom watering is the easiest and best way to maintain these plants, but the soil almost always needs to remain dry when the plants are resting. Watering needs to be done according to the growth cycles of succulents and cactus plants, and knowing when to expect this is only somewhat useful. Some succulents do most of their growing during the winter then rest during the summer months, and these need plenty of water. Other succulents and most cactus plants do most of their growing in the spring and if they're going to bloom they will do so at the end of this spring growth cycle. A few species of cacti will do most of their growing and blooming in the cool fall weather at the end of a hot dry summer. The best way to understand when the succulents are likely to go into a growth cycle is to know the species name and do some research, but what holds true in habitat will often fail in house plant conditions. As a four seasons house plant it is difficult if not impossible to imitate the natural watering cycles succulents and cactus plants have and expect them to grow and rest exactly as they would in nature. The timing of when to water and when to keep the pot dry is best regulated according to signs of growth from the plants own sense of timing. The beginning of watering cycle in the spring can be determined by watching for signs of new growth such as the emergence of new spines or even a flower bud. When the plants have finished growing and or blooming then it is time to start drying them out. For most of these plants there should be two wet and two dry cycles and when they need water they can be incorporated into the same routine as other houseplants. The most important adjustments that will insure the long term survival of succulent and cactus house plants is to stop watering them when they are resting, and resume watering when they begin to grow. Over watering can cause swelling or elongation of succulents and cactus plants, and it's important to avoid mistaking these conditions for growth. When plants are in their resting cycle they won't show the emergence any new spines or fresh skin, but they can look like they are growing if they are over watered. This is very bad and the plant is actually under stress and can die from too much water. In this situation it is important to stop watering the plant and keep it warm until it dries out again. If the soil is extremely wet removing the plant from soil completely and letting the roots dry out can often save the plants life. An unpoted plant can be dried out for several weeks under a plant light or by indirect sunlight. Later the water stressed plant can be potted in mostly dry soil and allowed to finish out its rest period in a dry condition. This has to be done before any fungus has started to set in for the procedure to be effective, because once fungus has started in an over watered plant it's time to start making funeral preparations. Note: Lithops are an exception in that when they show the emergence of new leaves they need to remain dry even though they look like they are growing. When plants are resting in their summer cycle an occasional small watering will be fine for most species as long as they can dry out between watering. Some succulents and cactus plants will actually delay their spring growth cycle until summer in more northern climates in which case they will need plenty of water. When this happens it's important to remember that these plants will be very happy to remain dryer when they are ready to rest in the fall. In the late fall it is a good idea to bath the plants and wash off any dust and sticky residues that may have accumulated to prepare them for their long winter sleep. Some species produce small amounts of sticky secretions, which may hardly be noticeable to us, but can become an invitation to fungi if the plants are left unclean. Growth for most species of cactus will be hardly noticeable in the fall washing can be considered the last watering for the next 5 to 6 months. During the winter for most species withholding water completely is the best method. Many plants will show signs of shrinkage during this dry period but this is normal and good as long as the roots do not disintegrate. Before deciding to water cactus plants because of shrinkage it is a good idea to examine the roots. The plant can be removed and replanted in their soil if the roots are kept dry before, during and after this procedure. If the roots are healthy and the body of the plant isn't producing any new spines it's better to continue to keep the shrunken plant dry. If the fine roots are becoming brittle and disappearing then very small amounts of water may be needed and this is best done by misting the plant after it is repotted. Even if the plant is shrunken and the roots are breaking off it is still better to avoid getting the roots wet. In all cases it's best to continue to avoid any kind of heavy watering until the plant shows signs of wanting to grow again in the spring. In the Spring after plants have been in their winter rest, it is very important to withhold watering until the plants actually begin to show signs of growth. It is often the case that succulent and cactus plants are the most vulnerable to rot from over watering just before they begin to enter a new spring growth cycle. Some species accept watering before they are ready to grow, but it is very risky to attempt to push any plant into a growth cycle with water too soon. There will be some plants with indications of growth that are difficult to see and obviously watering can't be postponed indefinitely. If the plant has been kept completely dry through the winter and has rested for over 6 months it may be safe to resume watering without seeing signs of growth as long as the plant has daytime warmth and enough sun. 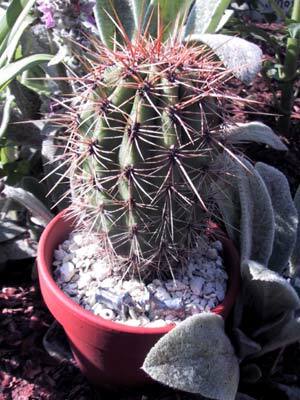 Cactus plants which are placed outdoors in the growing seasons and receive rain are unlikely to require any fertilizer. Outdoor sun and rain will produce the healthiest plants and they are much more able to grow and flower than if they are always kept indoors. Rain water and the chemical reactions it causes in soils will provide enough nutrients for most cacti to do well as potted plants. Most commercially available products will fail to allow the roots to get enough air and worse yet compress and harden over time. It is a good idea to make your own cactus and succulent soils or at least modify any available ones that you use. What's needed is a very course rocky mix with only very small amounts of sand and organic matter for potted succulents and cactus plants. There is usually plenty of sand in the natural environments where succulents and cactus plants grow but as the dominate feature in a potted cactus most sands will fail to perform well in the long term. The particles of sand are too small to allow the soil to dry fast enough when these plants are kept as house plants especially in more humid four seasons climates. Most sands are simply too fine to allow enough air to circulate through the soil and they get worse by compressing over time. Tightly compressed soil is a bad condition that will eventually kill almost any potted plant including cacti. Pea gravel and rocks will perform much better as the dominate feature of your soil mix with sand and organic matter in small amounts only. Most of the soil's water retention abilities will depend on the amount of organic matter and it is important to keep in mind that succulents and cactus plants need fast drying soils. Organic matter is needed, but nitrogen rich decomposed potting soil that most broadleaf tropicals thrive on need to be avoided. Any organic matter like sphagnum moss, wood bark work well when included with only a very small amount of sterilized potting soil. Most succulents and cactus plants will not tolerate the kinds of soils that lawns and gardens are typically thrive on. It's better not to trust digging up any ordinary outdoor soil unless you live in the south west and know that you have cactus friendly soil. If you do decide to add anything that you dig up outdoors as a part of your mix it is a good idea to sanitize it by baking it in an oven at 225 degrees for a couple of hours. Obviously, allow the heat sterilized soil to cool before you use it for planting. Most people who grow succulents and cactus plants in flower pots believe that the clay or terra cotta pot works better than plastic ones. This is more a matter of personal preference and what works best for each individuals plant care giving habits. Use plastic, plain clay or glazed clay pots, as long as there is a hole in the bottom for water drainage. Whether you decide to use clay or plastic it is important that the roots never soak for long periods of time in standing water, so avoid leaving standing water in a dish under the flower pots. Flower pots that are glazed are also fired at a higher temperature than terra cotta flower pots. These high fire pots are especially good for growing cactus plants that are placed outdoors in the growing seasons. These kinds of flower pots are usually more expensive than plastic or terra cotta flower pots, but they have advantages. Plastic will wear out from sun exposure and eventually crack and break. Clay or terra cotta pots will accumulate alga growth over several years, as they age, especially when they are placed outdoors in the warm seasons. Cactus plants will be much healthier if they can be placed outdoors for some rain and direct sun, any kind of flower pot will work well under these conditions for several years. A high fire or glazed flower pot will cost more but last much longer as well as maintain a healthier environment for the root systems of cactus plants. These Gymnocalycium plants are in different stages of progress between winter rest and going into their spring growth cycles. Many species of cacti noticeably shrink when they are in a state of dormancy and this is part of their ways of surviving through the coolest winter months. This winter dormancy is similar to that of deciduous trees losing their leaves for the winter, but with cacti they have shrinkage both above and below ground. This period lasts for about 4 months in nature and can even be as long as 6 months when cacti are kept as house plants. If the cacti in this photo are watered the one on the right will remain shrunken because it is still resting while the other two plants will benefit from and need water. These cacti began to lose water in the fall, and it is normal for them to shrink and look smaller over the winter months. The squat appearance of the one on the right might remain the same even if it were given water, because it is still in a state of rest. The cactus on the upper left has entered its spring and summer growth cycle, and the plant just below it is only beginning to come out of its winter rest period. The two plants on the left need to be given plenty of water because they are in growth cycles, but the one on the right needs to have its soil kept mostly dry. Watering can be a serious issue for these plants when they are in a shrunken condition, because their actual need for water depends on the specific season. In the summer months shrunken cactus plants may be suffering from dehydration, and actually need water to keep them healthy. However, in the winter months it is important to avoid assuming that a shrunken looking cactus needs water, because wet soil may do more harm than good. 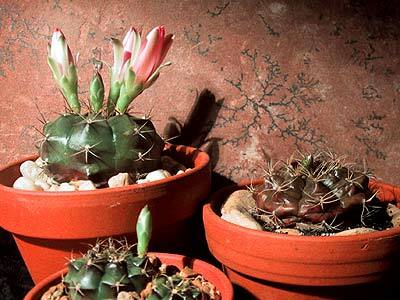 There are some varieties of cacti which will be at risk for rotting to death even if they are watered one time in their state of winter rest, like Copiapoa, Epithelantha, Eriosyce, Escobaria and Neoporteria species. In this situation a cactus may take one to two months before it finally dies, but the genesis of its demise will be from wet roots and fungus. Cactus plants can be at risk for fungal attack if their soil is wet when they are resting, and for most globular species it is best to keep them cool and on the dry side until spring. The Cactus Primer, by Arthur C. Gibson and Park S. Nobel mentions the occurrence of skin breakage on cacti from absorbing water. 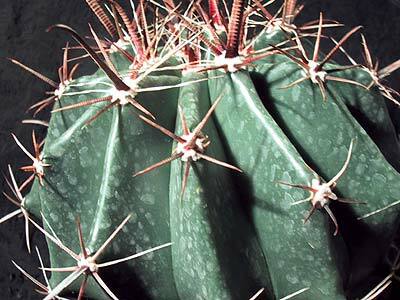 Cactus plants are opportunistic water hoarding plants and many species have the ability to soak up so much water that they break their own skin. According to Gibson and Nobel, "a cactus stem can tolerate up to 82% loss of its water without fatal consequences; and after rehydration, the same plant may show few outward signs that it was ever wizened and close to death....Of course, the skin can only be stretched so far and you can hurt a cactus with too much kindness. Many fine specimens of saguaro and barrel cactus have been watered so frequently in cultivation that they have developed high turgor pressure in the stem, which has caused the skin to split." A top dressing which we've found most effective for our plants is a product called; Aragonite Crushed Coral by CaribSea. This material is a marine substrate for salt water fish tanks and it has some small sea shells which also makes it an attractive material. It is more expensive than decorative stones, but can be included in the mix with small stones. Species of cactus plants which are vulnerable to rot will be less likely to have fungal problems with this product as a top dressing. Aragonite Crushed Coral can be found for purchase in pet stores where fish tank supplies are available. It is attractive to have some decorative stones around the top of the flower pot, but this can be functional too. Succulent and Cactus plants used as topiaries will gain several benefits when the flower pots are topped off with rocks. The top rocks will prevent rain from washing away the soil and help keep the cactus clean. Without top rocks the rain will splatter potting soil back up on the sides of plants and this not only looks bad but can be harmful too. The small spots of dirt can eventually cause scars or even cause a terminal case of rot by encouraging fungi to grow. Encouraging cactus plants to bloom is usually a matter sunlight, water and especially the age of any specific variety. Cactus plants reach flowering age according to their species with some becoming ready to bloom in a few years, and others taking decades before making their first flowers. There are many varieties which almost never bloom as house plants, but the majority of them may bloom with good conditions. It is important to avoid thinking of cactus and succulent plants as unusual sorts of vine-less garden vegetables. The same considerations for garden plants like sunlight, water and soil nutrients are important, but increasing all of these things as though the cactus were a tomato plant will often fail to achieve the desired results. These things do encourage flowers to happen, but must be considered according to the specialized needs of succulent and cactus plants. Keeping all care in the order of seasonal changes when providing the plants with sunlight, water and soil nutrients will encourage cactus plants to bloom as long as they are old enough. The most important flowering requirement is sunlight in the growing seasons, and the amount of sun light needed to produce blooms will very greatly for different species of cacti. For cactus plants which seem unwilling to bloom more sunlight is the first thing to try by finding brighter locations for these plants. To encourage flowers as well as the general health of these plants, light needs to be abundant primarily in the spring, summer and fall. Most species of cactus plants will flower better if light is lowered in the winter and then increased in the spring in order to stimulate buds. Winter is a time for keeping cacti cool, dry and out of excessive sunlight and for most species this is more beneficial than keeping them in the hottest southern window all winter. In this winter rest period too much sun becomes counterproductive and causes plants to use up their stored energy reserves just to survive instead of saving resources for making flowers. If cactus plants are old enough to bloom but haven't made flowers yet, the first and best thing to try is increasing sun exposure during their growing seasons. 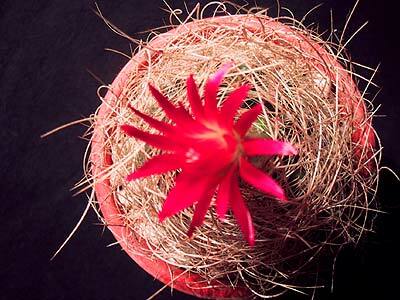 Watering cacti must be done according to seasonal changes, and for the promotion of flowers water is a necessity. For most species; plenty of water is needed after the plants begin to show signs of their new spring growth, occasional small amounts of water in the summer and only slightly increased amounts from late summer to fall. The winter season requires a long period with very dry soil and it is ineffective for encouraging flowers to water cactus plants too much while they are resting. Wet soil in the winter causes numerous problems like distorted growth, scaring of the skin, and worst of all watering may cause them to die from fungal infection. To end the long dry winter resting period for most cactus varieties it is usually best to wait and see that they are showing signs of new spring growth, and then resume watering. Water must be given or withheld according to seasons, and after they have started to develop their flower buds or are growing new spines from the top of the plant they will need plenty of water to make flowers. Please note that some species of cacti like Epiphyllum, Hatiora and Schlumbergera need some water year round and an extended winter dry period will harm these varieties. Fertilizer is often considered to be a way to produce flowers from many plant varieties, but with cactus plants it's difficult to tell whether adding nutrients to their soil actually makes them more willing to flower. If fertilizer is going to be used it is best to use a product designed specifically for cactus and succulents and follow the label directions. If there are no specific directions an application of fertilizer once in the spring may give the plants a slightly higher potential for producing flowers, but for the most part fertilizing only makes the plant caregiver feel like they've made their best efforts. Cactus and succulent plants grow slowly and store up the energy they need for flowers over long periods of time, and in most cases it's more a matter of waiting for the plant to reach a mature age than increasing the fertility of their soil. From our experience vinegar may be used on cactus and succulent plants on the condition that, in most cases, the product is rinsed off of these plants very very soon after it is applied. Vinegar left to dry on these plants can cause cosmetic damage to skin or worse cause enough damage to leaves, stems or the root systems to open the door to death by fungal infection. The vinegar we've tried is intended for use in cooking which, in most cases, is a weaker acid than horticulture vinegar. For our tests vinegar was sprayed of several varieties in an amount that would completely cover the plants in 2 applications given 2 weeks apart in time. We have no interest in testing horticulture vinegar, because the vinegar for cooking proved to be strong enough to show results both harmful and with some benefits. In some cases the damage caused by vinegar only left scares, but in others the applications created conditions for fungus to attack these plants. Some plants such as Aloe, Haworthia and Euphorbia suffered small amounts of cosmetic skin damage. 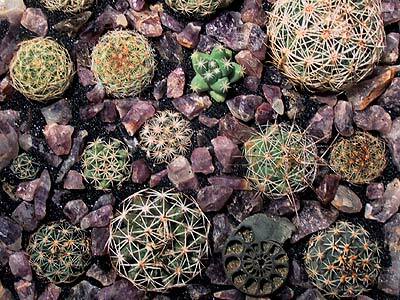 Other plants sprayed in the same manner such as Hurenia, Echinocereus, Mammillaria and Rebutia suffered fatal results. The plants which died from the applications of vinegar were done in by fungal infections anywhere from 2 weeks to 3 months after the second application of vinegar. It is important to keep in mind that cactus plants often appear healthy for several months after they have been fatally damaged. All of the plants we subjected to 2 spray applications of vinegar suffered some kind of damage if the vinegar was left to dry on the plants. Beneficial Uses of Vinegar on Cacti and Succulents - 4 Different Kinds. Two things have to be done for this to work with the minimum risk of harming the plants; first remove the plants from their soil and second rinse the vinegar off of the plants very very soon after the application. Spraying vinegar on a potted plant and letting the fluid run into the soil can, in some cases, lead to the death of the plant. Working with the plant removed from its soil will keep the vinegar from soaking into the roots and minimize the potential for root damage. The Ferocactus pictured above has the kind of hard water stains that typically build up on plants watered frequently with tap water. This plant was unpotted, sprayed with vinegar for about a 30 second exposure and then all of the vinegar was rinsed off under running water. The vinegar dissolved the hard water stains and the cactus was repotted a few days later. In general it is a good idea to dry cactus plants out, in bare root form, for a few days before repotting them. A good location for this drying out period is in a northern window where they will receive indirect sun. Any time a cactus is being potted or repotted it is better to keep the roots dry and, as it was in this case the entire plant was left to dry for a few days before being repotted. This Ferocactus is now free of hard water deposits and is being watered with rain water to prevent the development of new hard water stains. It is almost impossible to make a recommendation for using vinegar for insect control, however horticultural vinegar may be a different matter, and we are ignoring this kind of product. We only tried vinegar for cooking as an insect removal solvent, and generally it is less effective than alcohol based products, or for that matter products designed to control insects like commercial insecticides. Insects have water resistant surfaces which provide protection for them in nature. It appears to be the case that removing insects with vinegar is almost as effective as using plain water because of the animal's ability to repel water. In an attempt to remove some mealy bugs from a Hurenia the vinegar would be repelled and the insects had to be scrubbed off with more force than if a solution of soapy water had been used. Perhaps enough exposure to vinegar would be toxic to insects and there may be some insects which can be easily destroyed by vinegar, but keep in mind that the cactus or succulent plants may also be harmed by the vinegar. Note: Vinegar applied to broad leaf plants with surface mold will often cause the plant to drop the leaf. This is also the case for succulents which produce thin leaf structures like Euphorbia milii (Crown of Thorns). Usually if a cactus or succulent plants have fungal infections the plants are simply going to die, but with surface mold the plants will have some skin damage but survive. We applied vinegar (of a strength intended for use in cooking) to a Crassula argentea (Jade Plant) and an Euphorbia meloformis with good results. The application of vinegar arrested the spread of the mold with one very light spray application only to the locations where the mold was attacking the plants. These plants retained scars on their skin where the vinegar was applied, and they would certainly have scars from the mold no matter how this mold had been treated. Keeping cactea as houseplants requires us to adjust our expectations, because they will grow much differently than they may look different than they do in their natural settings. If you have seen succulents and cactus plants growing in their natural habitat it is important to understand that it will look different as a houseplant. Growth as a houseplant will be much slower, spines will be shorter and it is often difficult to get many species to bloom. It is impossible for succulents including any cactus kept as a house plant to have the good life that it would live in it's own natural habitat, but they are still beautiful houseplants if we keep reasonable expectations. This plant, grown from seed, is a house plant over 10 years old and spends its summers outdoors in Wisconsin. Compared to a Pachycereus pringlei growing in its natural habitat this specimen is about the size of a 3 year old plant. Thanks to information from Steven Brack of Mesa Garden, a Pachy growing in its natural habitat for 10 years would be about 3 to 4 feet tall, and a 3 year old plant would be 4 to 6 inches high. This house plant, in a four season climate, is a 10 year old that has only grown as much as a 3 year old Pachycereus would in habitat. It is possible to keep succulent and cactus plants as four seasons houseplants, but it is unreasonable to expect them to perform as they would in nature. 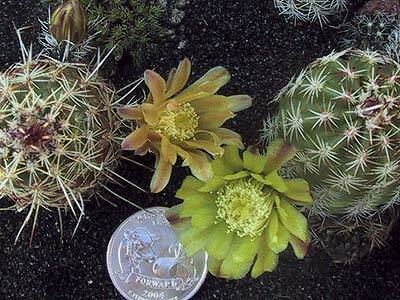 The monopoly dogs (shown on the surface of the cactus potting soil) are shown as a size scale reference.